OTHMAR SCHOECK (1886-1957): Concerto for Cello and String Orchestra, Op. 61, Suite for String Orchestra in A Flat, Op. 59, Sommernacht - Pastoral Intermezzo for String Orchestra, Op. 58. Description: Such attractive music and so little recorded. 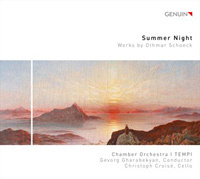 Sommernacht of 1945 blends sounds of nature and village life with a bed of string sound which recalls the Schoenberg of Verklärte Nacht and Richard Strauss' Metamorphosen Likewise, the 32-minute, five movement Suite (also from 1945 and currently only otherwise available on a 21-year-old cpo release) and the 1947 concerto are far more consonant in their harmony than Schoeck's inter-war works, the latter offering the soloist cantabile lines which have a lot in common with the style of the composer's contemporary song cycles. Christoph Croisé (cello), Chamber Orchestra I TEMPI; Gevorg Gharabekyan.